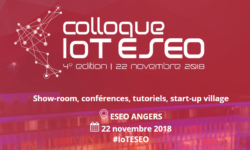 During the week of November 22nd, 2018, Nke Watteco will participate in the IoT ESEO conference in Angers. This event is a meeting where will be presented innovative solutions in electronics and digital. Through showrooms, conferences, tutorials and business meetings, participants will find or propose several solutions that can be adapted to your needs. On this occasion, many prestigious organizations such as: WE Network Cluster, Jessica-CapTronic network, or Angers French Tech will be gathered around a steering committee. Come and meet us there! Our team there will be very happy to meet you. Internet of Things is at the heart of the "4th Industrial Revolution", Nke Watteco too ! During this new edition of Cap'IoT, Synox and its ecosystem will give you the key elements to successfully undertake an IoT project. The company will be represented by Mr. Philippe Ronci, our sales manager. We invite you to come and meet us on November 9th 2018. Registration is free !!! [simple_tooltip content='Access to the SNEF website'][/simple_tooltip] nke Watteco is proud to announce the partnership with SNEF Lab. 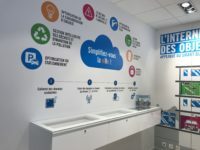 This alliance is the answer to the needs of customers in telemetry at optimized cost: A full range of LoRaWAN multi-purpose sensors A national presence and recognized know-how in the installation and integration of products and services This is the guaranteed success of a turnkey IoT solution. Do not hesitate to ask us for more information via the contact form, the nke Watteco team will be happy to answer you. NKE WATTECO conveyed its partners and clients to its LoRaWAN seminar. The event took place in Nice at Hotel WESTEND**** on March 16th and 17th. The first day was dedicated to our partners programs presentations : from “Deploy end-to-end LoRaWAN private network” by ACTILITY to “Smart water network” by SMARTEO WATER then “How to make your IoT LoRa compliant” by OBJENIOUS and to finish with “LoRaWAN and Smart building” by INTENT Technologies. The second day was organized around different workshops that put sensors usage into practice, with demonstrations on data reporting. Introducing the Unik2 Rally GPS in the "Rallye des Gazelles"
Come and visit us on the MWC exhibition from February the 22nd to 25th, in Barcelona (Spain). We will welcome you on the LoRa Alliance booth (hall 8.0, stand 8.0) Mobile World Congress, or MWC, is an annual gathering for the mobile industry and related industries, organised by the GSMA, and held in Barcelona, Spain, the Mobile World Capital.